Hands-on review: first impressions of the Naim DAC-V1 and NAP 100 | What Hi-Fi? So Naim’s putting all its ‘computer audio’ efforts into streaming products, isn't it? After all, since it launched the original NaimUniti – amazingly, that was just short of four years ago, time flying when having fun and all that – it has introduced eight more streaming players or systems in various guises, along with the n-Serve ripper/storage device. However, turns out it's not all streaming: along the way it’s also added a DAC to its mainstream systems, but with the recent arrival of the DAC-V1 it now has a dedicated asynchronous USB DAC, designed for direct connection to a computer’s USB output. Yes, until now it's been somewhat neglecting the ‘desktop audio’ market: those users who like to sit and listen at their computer, or at least with the computer relatively close to the hi-fi. While Naim was busy streaming, a whole industry has sprung up making DACs designed to be connected to computers. And what's out there ranges from hefty mains-powered full-size hi-fi components sporting one of those square USB Type-B sockets on the rear panel to little devices you can pop in your pocket – the likes of the Audioquest DragonFly and Meridian Explorer. 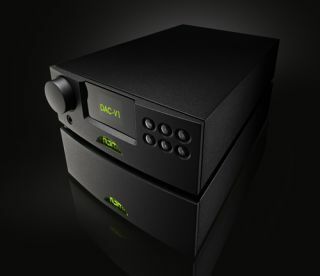 But the £1250 Naim DAC-V1 is much more than an exercise in playing catch-up: it’s not just a USB DAC, and the first Naim product to have asynchronous connection, but is also a complete preamplifier, with five more digital inputs on offer. There are three electrical – two on phonos, one on a BNC – and two optical Toslink sockets. Output is via the usual choice of stereo phonos or Naim’s favoured locking DIN socket, and these can either be run at fixed level – for example to run the DAC-V1 into another preamp or an integrated amp – or at variable level, using a precision analogue volume control driven digitally, so the output could be fed straight into the NAP 100 (of which more in a bit) or any other power amplifier. Oh, and there’s also a front-panel headphone socket, accepting a full-size 6.3mm stereo plug – no messing around with 3.5mm tiddlers here. Under the lid, this is no simple exercise in ‘bung in a DAC chip and some switching’: the DAC-V1 draws on the digital experience gained in the original Naim DAC, as well as the development of the ND range of streaming players. And it goes beyond any Naim device to date in the formats it can handle, going all the way up to 24-bit/384kHz. Naim’s custom-designed 16x oversampling digital filtering, as found in the company’s original DAC, is used here. It’s implemented in DSP on a SHARC ADSP21489 processor which also controls the ‘zero S/PDIF jitter’ system, which takes the incoming data, buffers it, and then reclocks it out at a rate suitable for the DAC and digital filter. The result is that the filtering and Burr Brown PCM1791A DAC, shared with the NDX and SuperUniti, are completely isolated from incoming jitter, whether the source is an S/PDIF input or the USB connection. In addition, the DAC-V1 goes to great lengths to isolate interference from the attached computer: it makes no use of the 5V power line the USB connection provides, the USB ground is filtered and the digital and analogue sections of the unit are galvanically isolated, using optical couplings, to isolate noise. Even the S/PDIF inputs are transformer-coupled to the same effect. And the asynchronous bit? Here’s how Naim explains it, and the explanation sums it up pretty well: Digital audio isn’t just about the data – 0s and 1s – and ensuring that each sample value is accurately converted into a corresponding output voltage. ‘Also vital to achieving the highest fidelity is ensuring that each successive sample is reproduced at a precise time interval from those around it. If that time interval varies – an effect known as jitter – then the output waveform will be distorted. That’s the succinct version: if you want to read deeper there's a Naim white paper on its website for download. The DAC uses a six-layer board designed for low interference, selected audio components throughout including film capacitors in the signal path and tanatalum caps in critical power supply sections, while the power supply itself uses a transformer with separate windings for the digital processing, DAC and analogue sections and multiple stages of regulation. Even the USB transceiver isn’t an off-the-shelf device, but has instead been custmised for Naim for use in the DAC-V1 – hence that 24-bit/384kHz capability. And of course the analogue volume control isn’t the simple way of doing things: that would be to implement volume adjustment in the digital domain, Trouble is, either attenuating or boosting levels digitally involves messing around with the purity of the digital signal, and that’s not at all what the DAC-V1 is about. I’ve mentioned in previous blog pieces that Naim usually seems to choose to make life hard for itself in the search for the best possible performance: in the case of the DAC-V1, it certainly appears to have done just that throughout the design, while also drawing on the knowledge gained in the development of previous products. For example, the matching NAP 100 power amplifier, selling for £650, also uses existing Naim knowledge: the company describes it as ‘a ‘classic Naim discrete transistor power amplifier’, using audiophile-grade selected components in a dual-mono configuration (derived from the SuperUniti all-in-one, itself based on the Supernait power section), and a linear power supply with a large toroidal transformer, each channel powered from a separate winding. Critical components are hand-selected and –mounted, and each unit hand-tested and adjusted, as is usual with Naim components. While clearly designed to complement the DAC-V1, with which it shares Naim’s half-width shoebox casework, it could also prove popular with other Naim users wanting a hideaway amplifier, or example for use with the NAC-N 172 XS. It delivers 50W per channel into 8ohms, and 75W into 4ohms, via the usual Naim 4mm sockets, and that should be more than sufficient for the kind of close-up listening for which this combination is designed. Inputs are on a choice of DIN or phonos, the former designed to ‘float’ thus isolating the amplifier stages from external vibration. To the same end both the DAC and the amp are housed in Naim’s usual die-cast alloy sleeve casework, designed for low resonance and resistance to electromagnetic interference, and the main board is physically separated from the speaker connections, again for vibration-proofing. Add to that the ‘shoebox’ styling, and those who go all misty-eyed at the thought of vintage Naim equipment will find it hard not to be reminded of classics from the past. The styling harks right back to the NAC 22 and NAP 120 of the mid-1970s, not to mention the original Naim Nait integrated amp (left). Back to the DAC, then and – for all its capability – there are some things the DAC-V1 isn’t: it’s not a network player, though you could stream content from a network using an attached computer, and neither is it capable of receiving Spotify, Last.fm, Rdio or any similar services (again, at least without the assistance of that computer). To say ‘all it is is a DAC’ is something of an understatement given the features already mentioned above, but it kind of gets over how the new arrival is meant to be used. Drivers will be needed to use it with Windows computers, as is usually the case, and Naim has these for download, but the DAC was instantly recognized by my MacBook Air laptop running OSX 10.8.3 Mountain Lion, Naim saying that the DAC-V1 will only function correctly with OSX 10.7.x Lion and later. Naim provides a range of configuration guides for the various software packages with which the DAC-V1 is likely to be used: if you’re going to go much beyond CD quality – and if you want to play FLAC files – you’ll have to look beyond iTunes, and for my time with the DAC-V1 I obtained copies of both Audirvarna and Amarra players for OSX. Time-limited trial versions of both are available: click here for Audirvarna (above), and here for Amarra (below). There’s a test routine built into the DAC-V1 using downloadable files to make sure you really are getting bitperfect – ie completely accurate – data from computer to DAC; you could just use this with the BitPerfect add-on for iTunes, but then I’d go out of my way to avoid using iTunes for anything I can. In fact, aside from downloading subscribed podcasts, I’m not sure when I last actually used it. The bitperfect test routine is slightly laborious, in that the files it uses are at a variety of bit-depths and sampling rates, from 16-bit/44.1kHz all the way up to 24-bit/384kHz, and you have to adjust the settings of your player software for each file, but it’s a routine you only have to do once for each computer/player set-up, so it’s well worth the effort. Anyway, if you want the read more about the set-up with various software players, download the Windows drivers or grab the bitperfect test files, you’ll find them all on the Naim DAC-V1 support page. Within the menu system of the DAC, you can change the names of inputs, select that fixed or variable volume, adjust channel balance, decide whether the DAC’s volume control or that in the attached computer controls the level, set a maximum level for the headphone output, adjust display brightness and the time until the display turns off, and even control the illumination of the Naim logo on the front: for example, it can be set to switch off when the DAC is muted. Oh, and firmware updates are simple, too: they’ll be made available as WAV files, so once you have ensured you have bitperfect working, all you’ll have to do is download the WAV file and play it through the DAC using your player of choice. That looks to be much easier than the upgrade procedures with Naim’s network music players, involving a PC and both serial/USB and network connections. Admittedly I’ve managed to do such upgrades successfully on the majority of occasions they’ve been needed, but not every time – on one occasion the procedure ‘bricked’ the piece of equipment, requiring a return to Naim for rectification. As I’ve said in the past, if you own one of these units and are at all nervous about attempting the upgrade, leave it to your supplying retailer. Fortunately the new method here seems rather more foolproof. But that’s for the future: for now, the DAC-V1, whether used as a standalone DAC/headphone amp or in full preamplifier mode together with the NAP 100, provided an enthralling, entertaining and entirely involving performance. I’ll leave it to the WHFSV review crew to provide their definitive verdict on the pairing when they get it into the test rooms, but I’ve been using the duo at home for a few weeks and it’s proved a total blast with everything from CD-quality files right through to super-hi-res stuff exploring the upper limits of the DAC’s ability. I’ve been using it in a desktop system with the little Neat Iota speakers; with the B&W P3 headphones; and as a DAC to feed the analogue inputs of my Naim Supernait/HiCap DRM amplifier, running into the usual PMC OB1 speakers. In every case the source was my MacBook Air laptop, connected to the DAC with a run of Chord’s USB Silver Plus cable. It’s played rips, downloads and even the ‘master tape’ DXD FLAC files available from Norwegian label 2L, which are in 24-bit/352.8kHz. And that means big files: an 18m 31s piano duo piece running to 56MB in CD-quality FLAC, or 187MB in CD WAV, runs to 269MB in 24-bit/96kHz, just under 642MB in 24-bit/192kHz, or a massive 1.42GB in DXD FLAC 24-bit/352.8kHz. But whatever the ‘320kbps is good enough’ brigade may have you believe, the proof of such monstrous files is in the listening: whether with that piano disc or something larger and more orchestral, complete with serious percussion, the DAC-V1/NAP 100/Neat Iota combination reveals the differences in detail, dynamics and sheer involvement. Meanwhile stepping up to the DAC into the ‘big system’ provided a real ‘come and hear this’ experience of ever-so-slightly jaw-dropping magnitude. Determined to give it a final chance, at the cost of an extra download, I bought the hi-res version, again from Quboz, fully aware that, while some of the content is in native 24/96, some tracks were ‘only’ in 24/48. Listening to the album again, I finally ‘got it’, and the volume levels began to creep up – one benefit of a) the house being detached and b) having a wife who’s out at work all day! In fact, loading up CD-quality and hi-res versions of the tracks into Amarra and comparing them is like listening to two different systems, so great are the gains in dynamics, openness and sheer rockularity. As I said, the DAC-V1 will get a more thorough workout at the hands of our eagle-eared test team in due course, purely IMHO I think the amp is a belter, and the DAC-V1 is possibly too good for its own good, its diminutive stature not preventing it from casting a very long shadow over the rather more expensive Naim DAC – which is, after all, almost £1000 more expensive. Would I switch from streaming to a DAC/computer set-up? Right now, probably not: the convenience of just being able to call up tracks using the iPad Mini I currently have as a remote control, and not having to sit with a laptop open and a cable snaking across the room to the hi-fi, would be hard to give up. But with, say, a Mac Mini in the equipment rack, run headlessly and controlled by an iPad, or for a system based around desktop listening, things could be very different indeed. Oh, and if you ever get the chance to hear some of those super-hi-res DXD FLAC tracks through a good system (such as one including the DAC-V1), grab the opportunity. You may never have heard a set-up sounding so good.